O.M.G. I'm not the only adult staying up late, watching YouTube and making bracelets out of rubber bands... Am I? I don't know what it is, but something about the bracelet-making process is addictive-- Is it learning the pattern? The repetition? The satisfaction of pulling the final product off the loom to the cheers of young children? *slight exaggeration*. While it is a somewhat addictive process, sometimes I find myself wishing that the final product wasn't made out of rubber bands... Maybe I need to take up knitting or something. 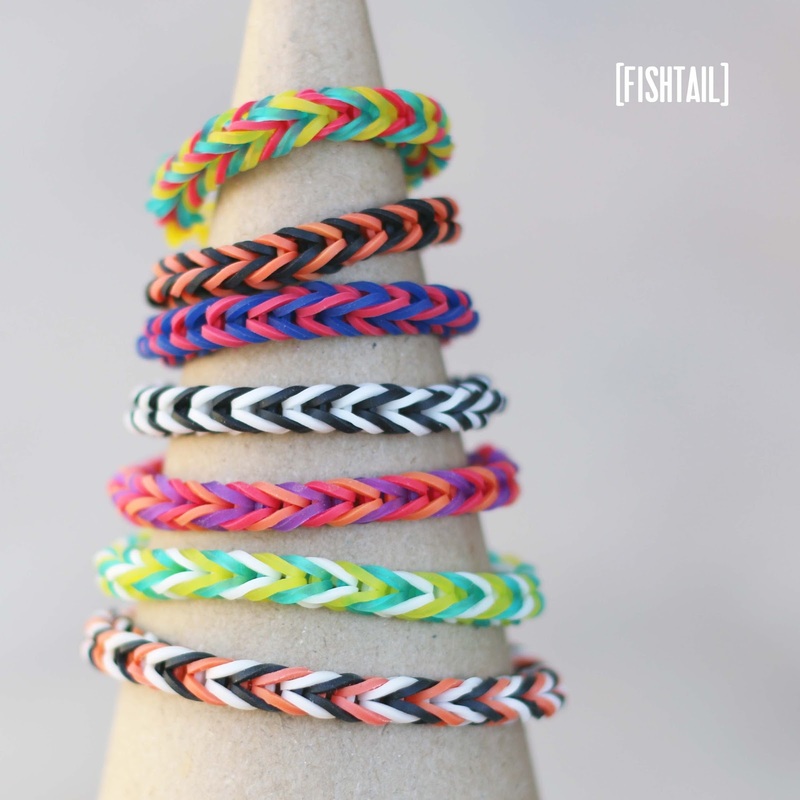 Anyhow, after spending time watching many rubber band bracelet tutorials, and getting frustrated with a few of them, I thought I'd put together a list of my favorites. I prefer tutorials with photos and written description, but it seems that most of the rubber band bracelet tutorials out there are videos. I've weeded through several tutorials and here are some of the ones that have worked for me. Now to be perfectly clear, not all of these tutorials are "professional" quality. There are several that are definitely more savvy, but I also included a few by young entrepreneurs and bracelet-loving-video-making mamas. Hey, as long as the tutorials are easy to follow, I don't need background music, fancy camerawork and professional lighting. 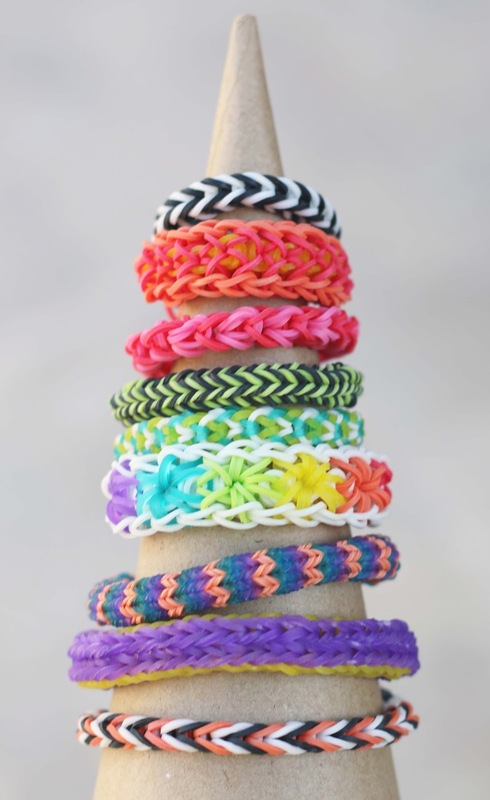 rubber bands - The bracelets in these photos are made from the rainbow loom brand rubber bands. I have recently ordered more bands in bulk from here. artbin carrying case (optional) - very helpful in keeping the colors sorted and readily available. My loom The kid's loom, fits in there too! 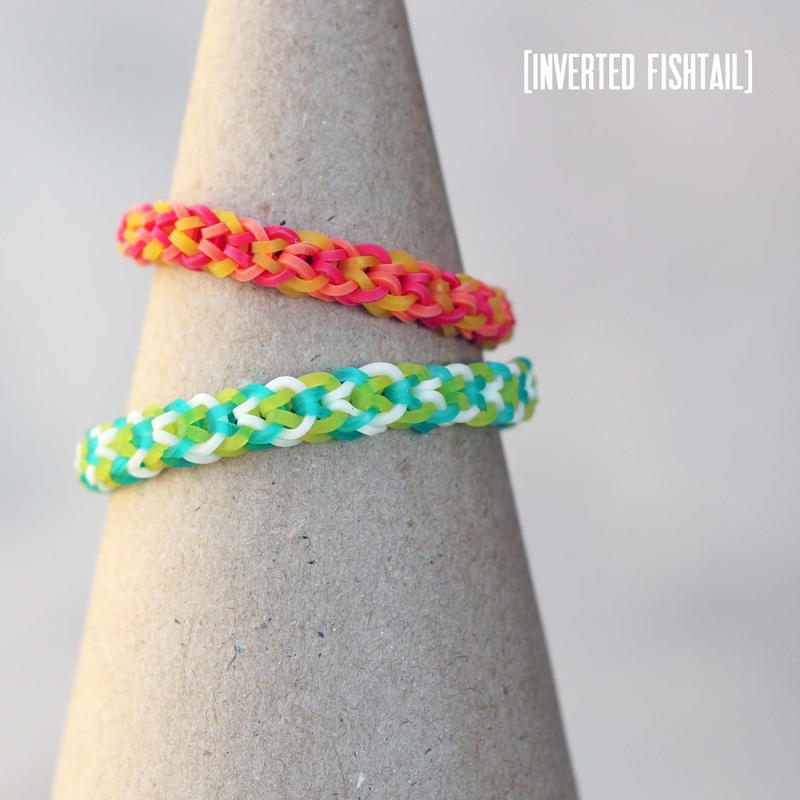 I like the look of the "braided" fishtail bracelets, so I've made several variations of them. The more pegs that are used, the more intricate and tight the braid will be. 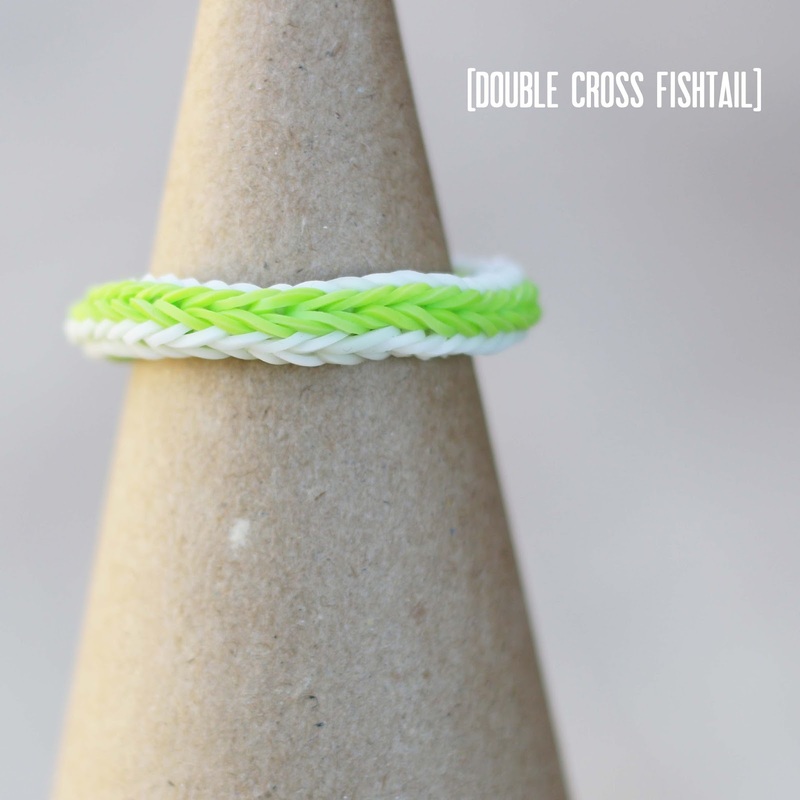 Fishtail [easy]- This one is easy and kid friendly. My kids (age 5 and 7) can crank these out without any assistance from me. Inverted Fishtail [intermediate]- I like this variation on the fishtail. 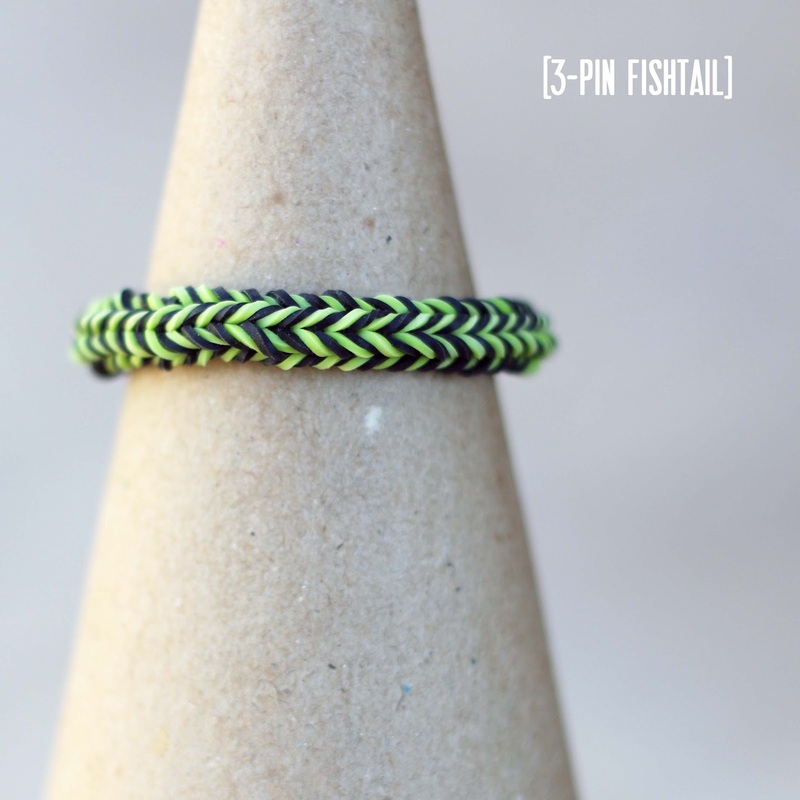 3-Pin Fishtail [intermediate]- This is my favorite fishtail. Not as time consuming as the hexafish, but with the same intricate look. 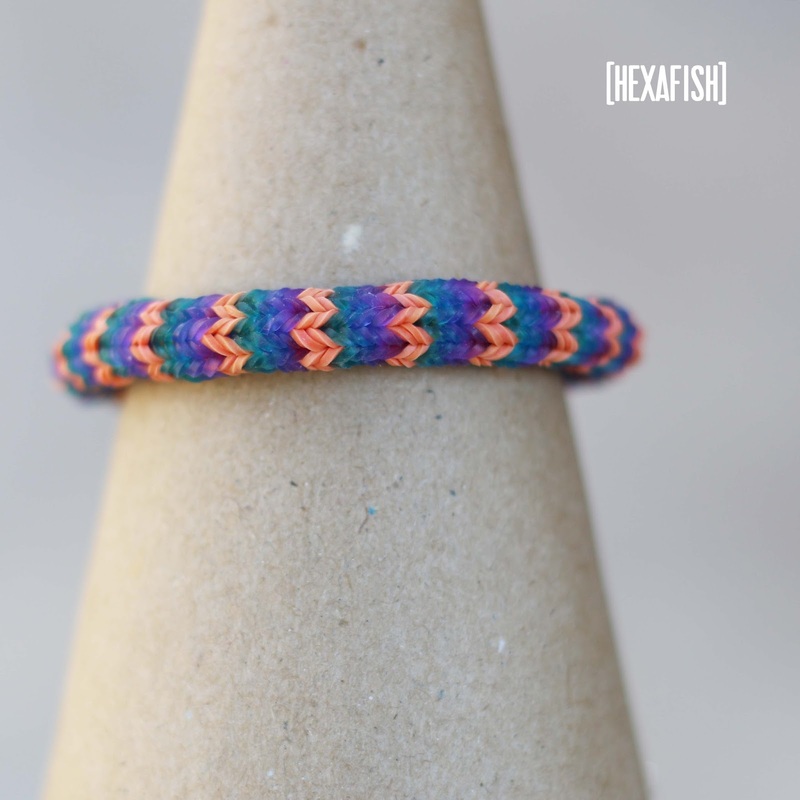 Hexafish [advanced]- this takes one loom, 120+ rubber bands and time (hour+). The ending is a little crazy, but I like how he condenses the amount of rubber bands so that it ends neatly. 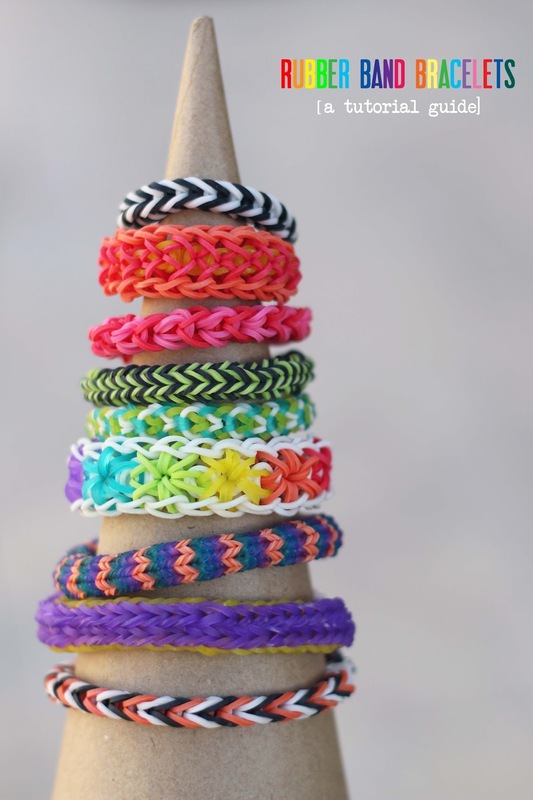 Loom bracelets can be tricky, but as long as you closely follow the pattern and make sure not to skip a pin while looping, they can be fun. 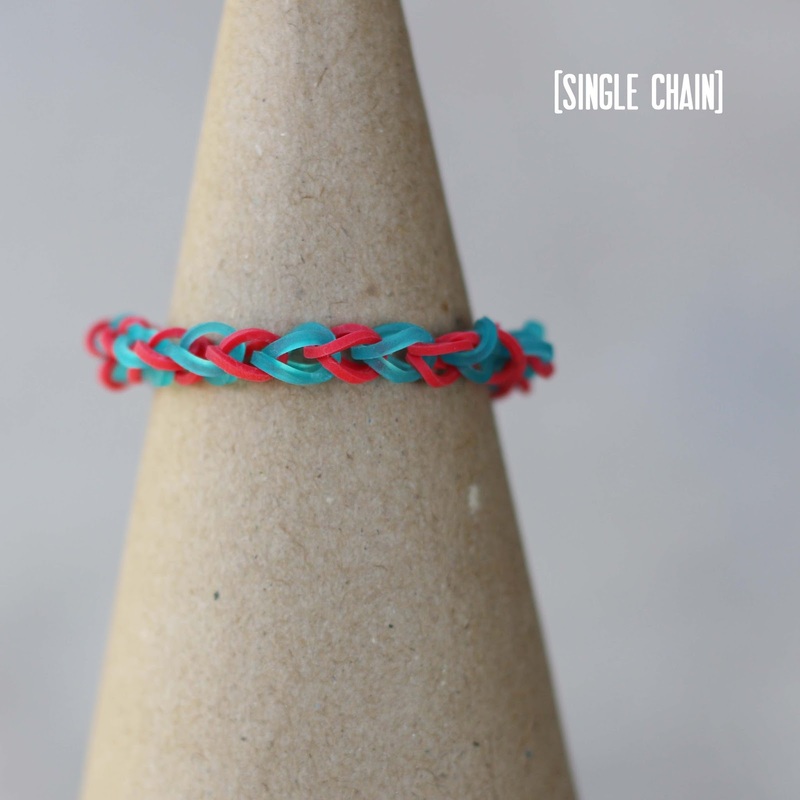 Single Chain Bracelet [beginner] - Very basic, but good to start with since most loom bracelets are based upon this pattern. The printed instructions are included when you purchase a rainbow loom. 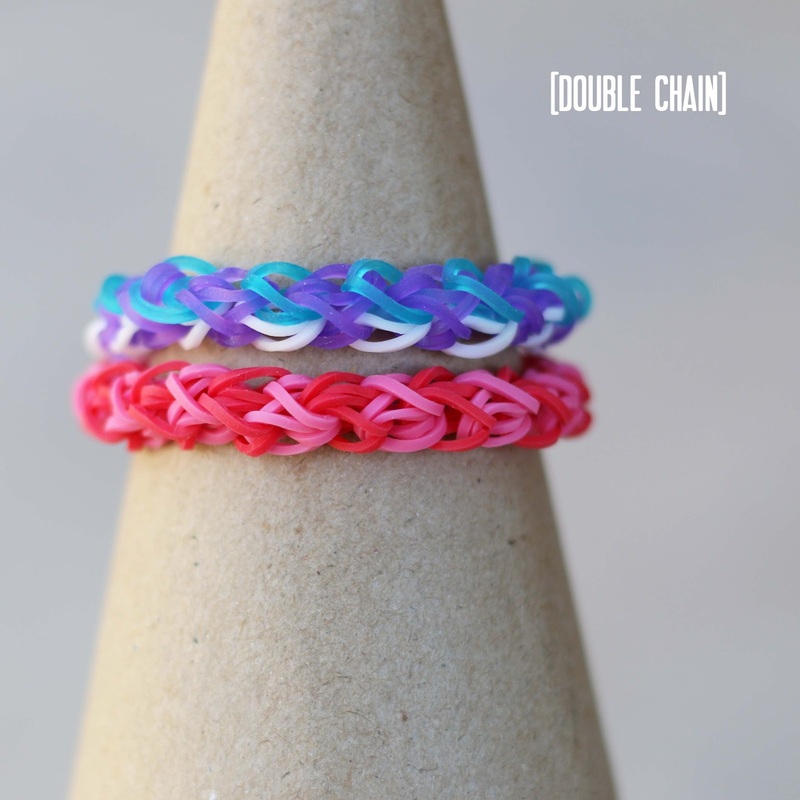 Double Rainbow Loom Bracelet [easy]- The only non-video tutorial that I used. If you look closely at the design, it looks like hearts. 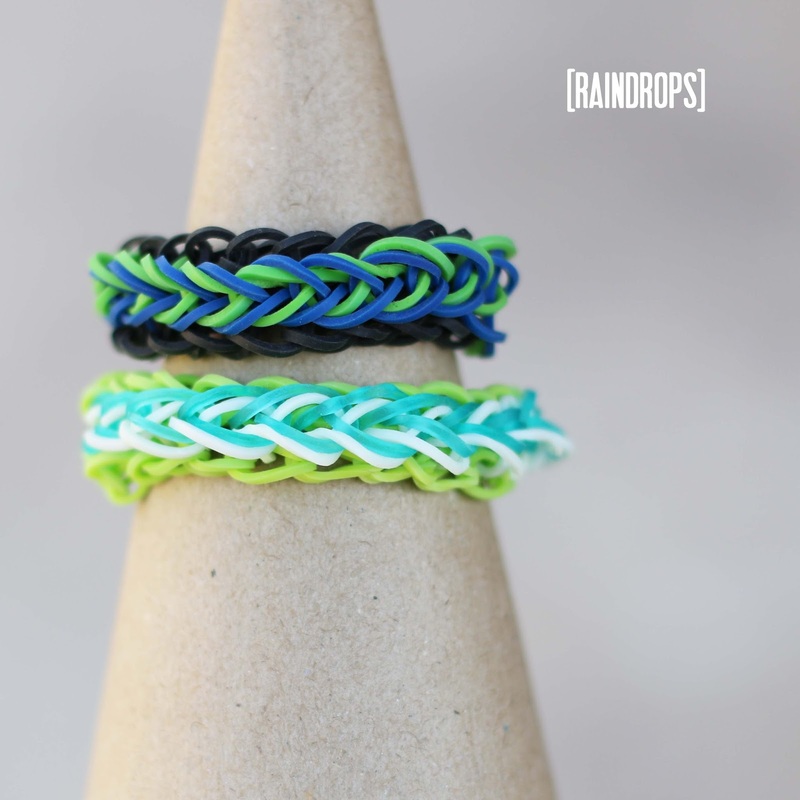 Raindrops Bracelet [intermediate]- My son's 7 year old buddy made one of these for him. I liked it so much that I hunted down this tutorial. Unfortunately I reused some bands (which is a no-no in rubber band bracelet land) so my bracelet (lime/turquoise/white) looks a little messy. 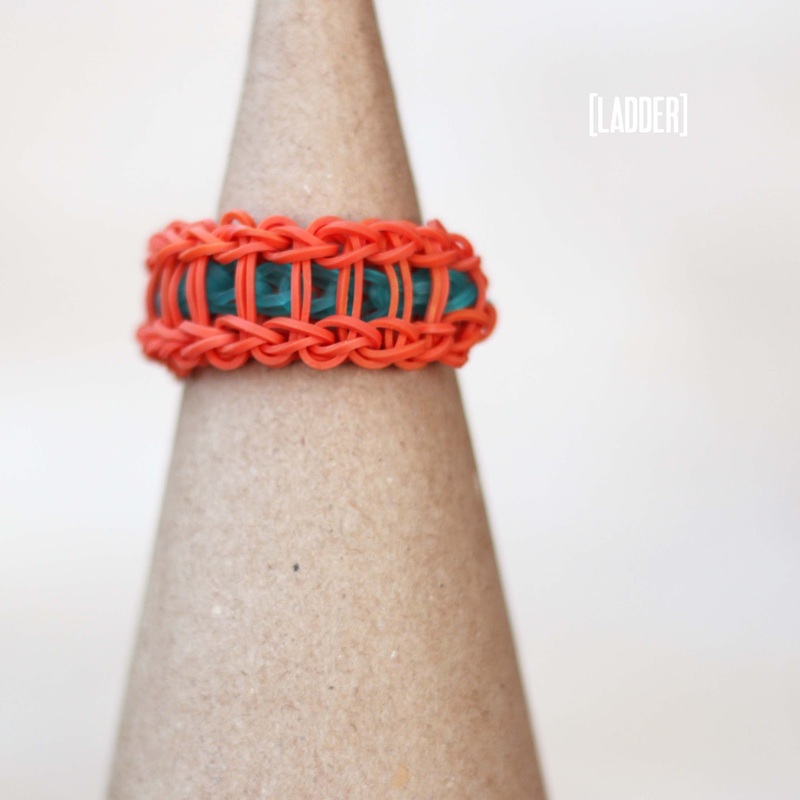 Ladder Bracelet [intermediate] - It seems like the boys like this design, I've seen many with black on the outside bands (reminds me of a tire). My son requested orange and blue and apparently got lots of compliments at school. Then he outed me and said his mom is into making rubber band bracelets... Shhh! Hey buddy, keep that on the down low! 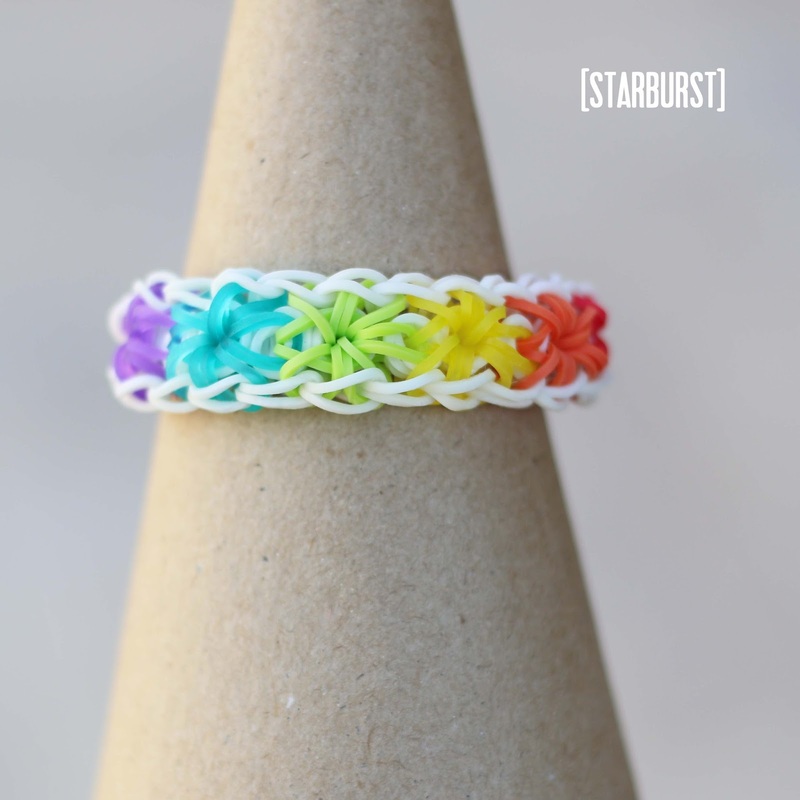 Starburst Bracelet [advanced] - People seem to get frustrated with this one. Just follow the order and don't skip a loop and you'll be fine. 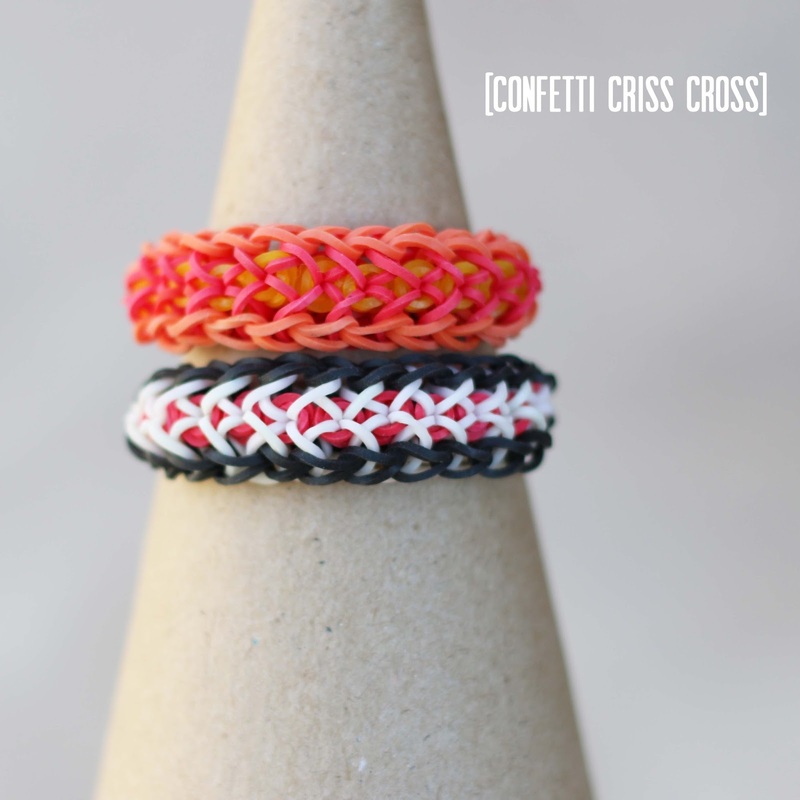 Confetti Criss-Cross Bracelet [advanced]- My cousin's awesome 12 year old daughter taught me this one over the holidays. So, except for a bunch of hot pink, we are out of bands. All gone. No more. Luckily I have an order of 2,500 bands heading my way... Yikes!